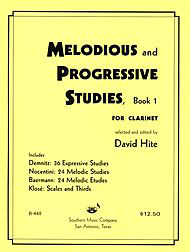 Hite Melodious and Progressive Studies for Clarinet Book 1. This book by David Hite is one I have all by junior high and high school students purchase when they start taking lessons from me. This is one of the best intermediate clarinet books on the market. The book has 96 pages of music. It has a great 12 major scale and relative minor (melodic minor scales) on page 92-93 and Klose Scales in Thirds on page 94-95. I know it is weird to write about the end of the book, but have scale references in a method is very important. look inside Melodious and Progressive Studies, Book 1 (Clarinet). Edited by David Hite. For Clarinet, Woodwinds. Woodwind Solos & Ensembles - B-Flat Clarinet Studies. Southern Music. Instructional and Studies. Grade 2. Collection. 96 pages. Southern Music Company #B448. Published by Southern Music Company (HL.3770637). Now, the beginning of the book has 18 Expressive Studies based on scales by Demnitz. These 18 studies cover key signatures up to four flats and four sharps. You can cover the harder key signatures in Hite’s Book II for Clarinet. This book then covers 18 Expressive Studies based upon chords also by Demnitz. Why are these nice to study? I, as a teacher, can assign arpeggio and chord studies until I’m blue in the face, but these studies are interesting sounding pieces of music (more interesting to learn than straight out arpeggios). If you are interested in learning jazz one day, make sure you know your arpeggios well, this is a good place to start. Now, on page 30, you’ll find 24 Melodic Studies attributed to Domenico Nocentini. These beautiful pieces give any student a good about of room to express themselves. These studies introduce simple key signatures with various rhythms, accidentals, and accents. These provide great sight-reading material for your students work sharpen those skills. How to use these studies as sight-reading material? Pick a page. Pick a tempo (get an idea from the movement title like Allegro resoluto). Using the best of your knowledge, you should be able to get the tempo from this movement title; however, Mr. Hite does give tempo metronome markings on each etude. Look at the key signature and finger (silently) through the difficult passages. Try to find scale and arpeggio patterns that hopefully your fingers have learned. Then, play through the piece. Do this in front of a clarinet teacher is the best way to tell if you are on the right track or not. Last but not least are the 24 Melodic Studies, Op. 63, by clarinetist Carl Baermann. These works offer challenging tempos, rhythms and forms to include a Gypsy Air, Tarantella, and Variations. This is a classic book for intermediate clarinet players. Below are lesson descriptions of two pieces in the book. Good luck practicing. Pg. 1, No. 1. Allegro non troppo, C Major by F. Demnitz. Practice your C Major scale before you play through this work. Keep your scale as even as possible. See if you can play the C Major scale at quarter note equals 80, and play the scale in eighth notes. If you can play the scale well at that tempo in 16th notes, practice it. Now, let’s sight-read No. 1. Look at the key, no sharps or flats. Notice how you have a few accidentals in measures 9, 10, and 14. What are accidentals? Where a measure includes notes that have a sharp or flat printed in front of them. These notes seem like accidents since they are not in the key signature of C major. Why are these accidentals not accidents? They fit in the music chord structure or might be passing or chromatic tones. Believe me, it works out. The genius composer figured it out for you to make it sound interesting. Now, you have to follow his/her plan. Now, take a good look at the scale patterns used throughout the piece and how they are varied between eighth notes and sixteenth notes. If you know your C Major scale well, you will breeze through this etude. If you do not, the etude will help you learn your C Major scale. As you figure out notes and rhythms, take a good look at the dynamics. So many young students worry so much about notes that they completely forget about the expression of the piece. It is the most important part of your study. Also, very important, if you are not able to play this piece well at quartet equals 80, back off the tempo to something slower. It is better for you to play a piece accurately and slowly before you play it at tempo. I’ve heard so many students play etudes too fast too soon. They teach themselves mistakes throughout. Pg. 20, No. 9. Andante, Ab Major by F. Demnitz. Please note that I did skip to page 20 to give you a sampling of this method book. Ab Major is a tough key for clarinet. To prepare well for this piece, know your Ab Major scale and arpeggio well. This piece starts slow at quarter = 76, then speeds up at measure 17 to quarter = 116, and then Pui mosso quarter = 126 at measure 33. The beginning Andante, is melodic and expressive. Play your dynamics to fullest capacity. At the Animato, you change to slur two, tongue two arpegiated figures. Make sure you keep your embouchure stable though-out this section. With large interval jumps, many young players real move the embouchure around too much. Also, do not bash the staccato notes. Staccato should mean light and detached, not BASH, BASH, BASH. The Piu mosso at measure 33, makes for an exciting finish. It has a smooth feel like the first section, but moves to triplets. The triplets are all arpegiated figures, remember what I said at the beginning, KNOW YOUR Ab ARPEGGIOS. Another good tip about this piece, take care to know your pinky alternate fingerings well. Since the Eb (4th space in treble staff) is the only right hand pinky finger (with no left hand alternate on most clarinets), you will make a good deal of use of the left hand Db and the left hand C. You will notice this especially in measures 34, 36, 38, 42, 43, and the last four measures of the piece. If you do not do this, you will have many gaps and breaks and unevenness to your rendition. Good Luck with the Hite Melodious and Progressive Studies for Clarinet. Again, you will find it very challenging. Now, to move to the harder key signatures. Go to Hite Book II for Clarinet.